Expats are uniquely placed to spread a culture of empathy and understanding because their lifestyle means they are more likely to routinely adapt to new cultures. In Chris’ words “they know what it means to be culturally naked upon arrival”. Some expats have found ways to make use of this and bring hope to the world in practical ways. Michele Cantoni is a great example of this. Michele is an Italian violinist who travelled to Palestine and was so moved by what he saw, that he decided to relocate there permanently and do whatever he could to invest through music in Palestine. He set up fantastic projects and created lots of opportunities for Palestinian musicians. One of these is particularly touching because it involves children. 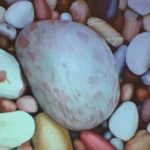 In this article he introduces us to Amwaj and explains why the project needs all the help and support we can provide. You can read more about Michele’s story here. Since my arrival in Palestine in 2003, I worked for The Edward Said National Conservatory of Music, both as the Conservatory’s Academic Director and as Artistic Director of its ensembles. In the summer of 2015, after resigning from the Conservatory, me and my wife, Mathilde Vittu (Professor at the Paris Conservatoire) established Amwaj (Waves, in Arabic). Amwaj counts today 60 children (35 girls and 25 boys), aged 7 to 17, from Hebron and from towns, villages and refugee camps of the Bethlehem governorate. Children are offered, weekly, eight hours of varied activities such as choral singing, voice training, foreign languages, music theory and history, conducting, introduction to piano and percussions, theatre and more. Children attend Amwaj free of charge, and there are no selection criteria, except committing to attending all classes and activities. Since its beginning in 2015, Amwaj has demonstrated, through countless performances and cultural collaborations, the value of its intensive pedagogical and artistic approach, and has attracted the interest of major cultural institutions, both Palestinian and international. 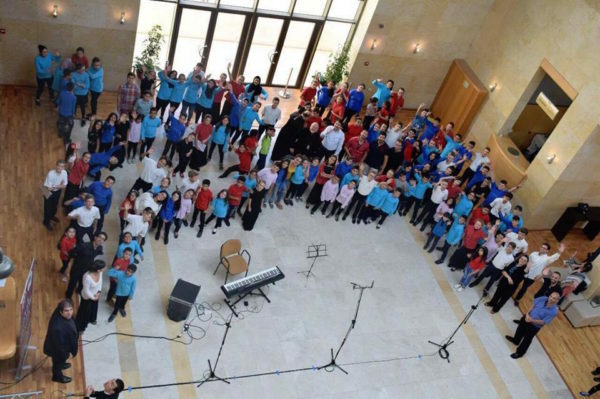 Last July, the Amwaj choir hosted 30 children aged 10 to 13, from one of the finest choirs in France, Les Petits Chanteurs de Lyon, for a one-week joint residency in Bethlehem that was a highly valuable artistic, pedagogical and human experience for all. After three days of joint residential summer camp, the French children were hosted by the families of our children. 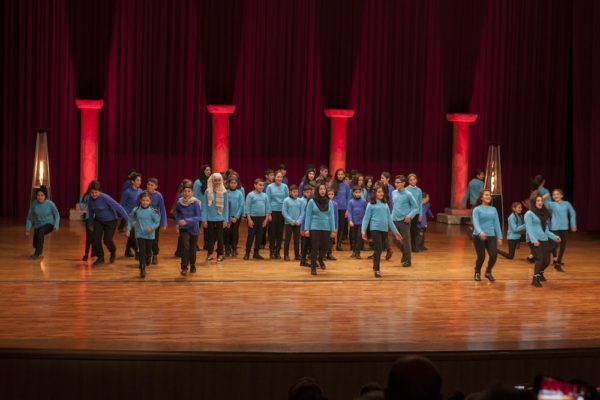 This exchange with Les Petits Chanteurs de Lyon has led us to organize Amwaj’s first international tour, which will take place this summer in France, with a series of concerts in Paris, Lille and Lyon. However, something happened during the latest phase of the exchange with the Petits Chanteurs de Lyon, at the beginning of April, in Bethlehem, which is pushing us to reconsider the travel itinerary. The last evening of the exchange, we were supposed to perform together in Jerusalem, so we had diligently applied for permits, several weeks in advance, following to the letter the procedure dictated by the Israeli military authorities. Until a few hours before the concert we had no news. The children waited anxiously, from early morning, at a cultural center in Bethlehem, for permits that never arrived. Eventually they were issued, but much too late for us to go to Jerusalem, therefore depriving the children of the right and joy to go and sing there. Luckily, that same afternoon, we had pre-emptively decided to move the concert to Bethlehem instead, and that very stressful day ended with a beautiful and emotional performance. The uncertainty created by such situations impacts our plans for the upcoming French tour. Flights from Tel Aviv are much cheaper than from Amman, so the difference in cost for a group of 65 like Amwaj is considerable. We are entitled to ask for permits to fly from Tel Aviv, but can we really risk losing all the flight tickets if the permits are refused or delayed at the very last minute? 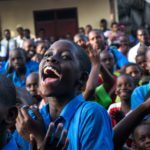 An international tour of a children’s choir is an exciting opportunity, but also a challenge at both an organizational level and in terms of funding. Your support is called for, as a contribution towards travel expenses from Palestine to France of Amwaj‘s 57 children and 8 volunteers. Any donation, however small, can help us.